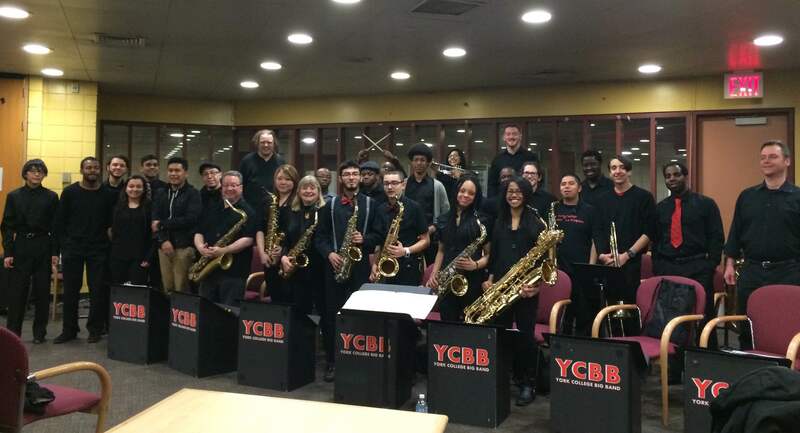 In preparation for the Spring Concert members of the York College Big Band played to a room full of faculty and students, performing a selection of songs by Carlos Santana during their Mid- Semester Teaser. The event held in the faculty dining room 2D01 offered a prelude to the upcoming Spring Concert, Viva Santana, a tribute to famous musician and songwriter, Carlos Santana. “It’s my life. It’s my favorite part of the week to come here on Wednesdays,” said Eial Kestelman, trombone player. He also expressed such effusiveness for their upcoming concert on May. 20 at 7 p.m. at the Performing Arts Center where he will also be playing. In this performance, he performed quite a few solos while many of his friends cheered for him. Jonathan Rodriguez, a guitarist on the band had this to say about his experience. “I don’t normally listen to this type of music.” He said, “But being in this band helped me open up to new music.” Since Rodriguez has been in the band he noticed “We usually do to two gigs each year. One in the middle of the semester and one at the ending of the year.” He also shared that York College’s faculty and students will be expecting him in the performance at the end of the year. As the performance took place, Tom his students gelled together and were carefree. There was a small humorous part where Eial Kestestelman and his peers were both playing the trombones. His peer tried to mimic Eial’s piece and even tried to play it better. However, Eial would not have it. He then played a difficult piece and his band member retaliated with a short note as he admitted defeated. It was a fun Trombone battle. There were many solos, there was even a saxophone solo played by Samantha Williams who performed a long piece that the crowd was amazed by. The musicians seemingly worked incredibly hard for this teaser and if students here at York are looking for a break from studying for classes, watching the band perform is uplifting and pure entertainment.